When Helen Keller was very young, she got a rare disease that made her deaf and blind. Suddenly, she couldn't see or hear at all, and it was hard for her to communicate with anyone. But when she was six years old, she met someone who change her life forever: her teacher, Annie Sullivan. With Miss Sullivan's help, Helen learned how to speak sign language and read Braille. Armed with the ability to express herself, Helen grew up to be come a social activist, leading the fight for people with disabilities and so many other causes. Each picture book in the popular Ordinary People Change The World series is a biography of a significant historical figure, told in a simple, conversational, vivacious way. 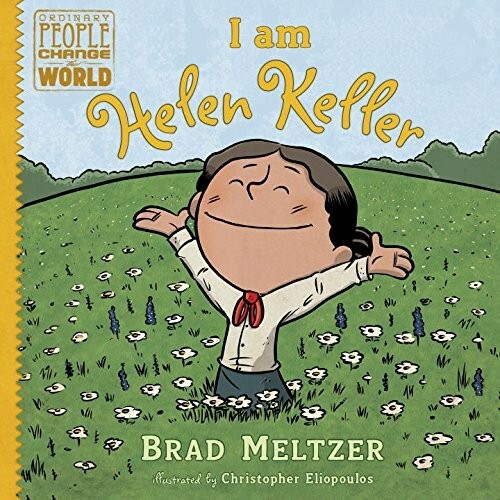 The heroes are depicted as children throughout, telling their life stories in first-person present tense, which keeps the books playful and accessible to young children. And each book ends with a line of encouragement, a direct quote, photos, a timeline, and a source list. For more books for all ages about this trailblazer, visit our Helen Keller Collection.